Pelemix’s coir – cocopeat is an excellent media for roots development. Therefore the volume of substrates / growing media is relatively small (compared to soil and other soilless medias). Since the volume is relatively small it is very important for roots to develop within all the media equally. The easiest way to achieve uniformity in the coir – cocopeat is by applying water in a way that water / air ratio and the E.C. levels in the coir- cocopeat will be the same. 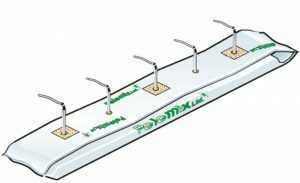 Pelemix strongly recommends on applying a slow flow rate dripper every 20 cm (or less). 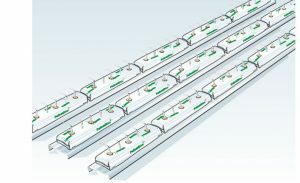 For example, a growbag (1 meter long) for 3 plants should have a dripper every 20 cm(5 drippers in total). During irrigation water and nutrients in the coir will bedistributed equally inside the coir – cocopeat and the E.C. levels will be same. The roots will develop through all the growing media’s volume without reflecting to the distance from the dripper. While using growbags for vegetables and Open Tops the use of arrow drippers is recommended. Purchase the growbags with holes for arrow drippers. 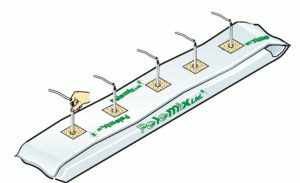 After placing the growbags, insert the arrow drippers into the holes and apply the CaNO3treatment through irrigation system (see Pre planting page). Make holes in growbag’s plastic and insert all of the arrow into the bag. Remove the arrow drippers from the growbags and re insert them normally. It is also possible to use a drip line pipe inside the growbags. This method is recommended for growing herbs in wide growbags (some growers use it for vegetables in regular growbags as well). After placing the growbags and making sure that the slab is in the middle of the plastic bag (see pre planting page). Cut holes in each side of the growbag for the drip line pipe. Insert the drip line pipe through the growbags. (One after another like sewing the growbags with the drip line pipe). Apply CaNO3 treatment through irrigation system (see Pre planting page). 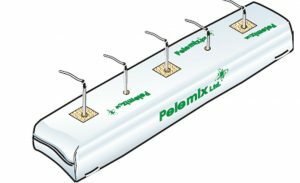 It is possible to buy Pelemix’s growbags with holes for drip line pipes and with planting holes. In growbags that were bought without planting holes, the holes must be made without damaging the drip line pipes.